If you are not very familiar with concrete grinding methods, the entire concept can be quite confusing. When dealing with this type of task, you want to be sure that you are using the best possible method for the job at hand. So, instead of sitting around wondering about the difference, continue reading to learn everything you ever wanted to know about these two methods of concrete grinding. The first thing you should know is that there are two methods used in concrete grinding. 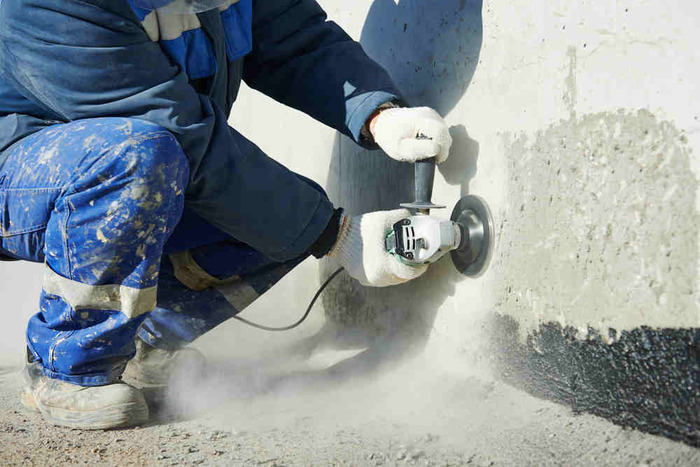 These are the dry and wet concrete grinding methods. The dry concrete grinding method is used to polish concrete, whether it is for floors, walls and countertops or something else. While they both are used for the same result, the truth is that their procedures are different. One main issue that people have with dry grinding is that the large amount of silica dust produced during the process. Not only does this settle on everything and make it look terrible, but it’s also risky to anyone’s health. This is especially true if you are able to breathe in this dust. It can cause several respiratory illnesses including problems with asthma and bronchitis. However, there are some grinding contractor services companies that offer a dust-free dry concrete grinding method. This is generally a big advantage especially for people who are health conscious. But, with the noticeable amount of residual dust that remains visible once the job is done, these dust-free claims are still in question. Another problem with all of the dust that lingers in the air is that it may settle inside HVAC systems, air ducts and ventilation systems or in furnaces. Again, this is very harmful to your health and it is not something that should be taken lightly. The dust that settles in HVAC systems can have a real impact on the way the system operates. For example, all of the dust can settle and clog the system. If and when this happens, you will have to shell out a significant amount of money to get things back in order. Many people who rely on dry concrete grinding method do so because they think they are making an environmental choice. The truth is that there is really nothing about this that seems like it is eco-friendly. That is why you need a skilled and knowledgeable professional to execute this job properly. You were told a bit of information earlier about the potential of dry concrete grinding to trigger some medical problems. Now, let’s discuss more in-depth information about it. The main medical issues that people will have to contend with are silicosis and lung cancer. While modern medicine can give a cure to one of these illnesses, it would be best to err on the side of caution. Prevention is always better than cure. When workers are completing jobs that exposed them to this dust, they are required to wear face masks in order to keep the dust at bay. Unfortunately, there are still many people who get these illnesses despite the fact that they have tried to take the steps to protect themselves. While floors that have been polished will always need to be cared for, completing the polishing with a dry method means that you will not have to put in as much work. While it will not show as much wear and tear as an unpolished floor, the reality is that you will have to look forward to scratches, worn areas and a lack of shine. While this is true, dealing with floors that have not been polished means that you will have much more work to do in order to properly maintain them. As you can see, there are some definite advantages and disadvantages when it comes to dry concrete grinding. Now it is time to expand a bit and discuss about its counterpart -the wet grinding method. This is very different from the other process simply because water is used in this method. Water keeps the diamond abrasives at a decent temperature and it prevents the dust from getting everywhere. As you were told earlier, this dust can be quite harmful. So, it is a good idea to try using a method that will prevent that from happening. Whether you believe it or not, most people have a huge problem dealing with the wet method. This is because when the liquid mixes up with the concrete, it creates a paste. This has to be disposed of properly or it will create a huge mess that can be hard to clean up. The good thing is that most companies that offer grinding services will provide a thorough cleanup. Therefore, you need to find a company that is very serious and takes pride in their work. One problem that many users have in common when it comes to wet concrete grinding is the longer process compared to the dry method. If your chosen contractor will charge you hourly for labour, this can get quite costly. The best option if you are insistent on having this method used would be to find a company that is willing to charge you a daily rate. You may be wondering why this is being discussed again. It’s because this is the only way to convey how huge of a problem this is. Have you ever looked inside of a concrete mixer and seen the concrete being mixed? This is not only messy, but it will take a substantial amount of time to get things back in order. Again, this is something that the contractor will be more than happy to take care of for you, as long as you have hired a reputable company that’s worth the pay. While this method guarantees that the polish will last longer on the floors, it also means that you will have less maintenance to worry about. As you know, the idea of having less maintenance generally means that you will have to pay a premium. Therefore, you will have to weigh the pros and cons and decide which is more important to you, saving on time or saving on money. If you would prefer the former, then wet concrete grinding would probably be the best method. However, you may be wondering how come this is true since the process can take a bit longer. The fact that you will not need as many return visits begins to even itself out. As you can see, there are some definite disadvantages, but the benefits tend to outweigh that. Now it is time to discuss a bit about the type of projects that require one or both of these methods. As you already know, you can use this process to create a stunning floor that can be the envy of the neighborhood. If you have ever walked into a home and seen a designer tile floor in the foyer, it is likely that they hired someone to create this polished look. You may also have noticed these polished floors in places like courthouses and banks. It can certainly help give a room a much better look. If you have been thinking about buying a huge slab of concrete for a countertop, keep in mind that most of it does not come already polished. You may end up paying a ton of money for a huge slab of concrete, and then look for someone to polish it for you. Remember, it is possible to buy one that has already been polished. However, sometimes, there is a specific design you are interested in applying in your countertop. There is no other way to get it than to buy the unpolished material. If you are a proud owner of a traditional bathroom, you know that you need to buy tile, putty and a few other things to go with it. These days more and more people are inclined to have a custom shower area. In this case, you will have to buy large slabs of concrete and have them worked on before they can be put up. This is a very expensive job and requires a skilled professional. However, doing this guarantees a durable work that can last for a long time. This makes it more than worth the money. Make sure that you always get a quote before hiring a certain contractor. Every contractor had their own fee rate and be sure to verify that the price you pay is the best one available. Contact the company and make appointments for quotes. Ideally, you should meet with a few people before making a final decision. It will always be in your best interest to hire someone who knows what they are doing. Talk to the people at the company and ask how long they have been in business. If you are not given a solid answer or the rate is fairly low, you should continue on your search. There are too many available contractors out there to get sidled with one that does not know what they are doing. That will only lead to shoddy work. Always ask a contractor for references. If you are told that they do not have any or they are very hesitant, this generally means that they have something to hide. You would be better off looking for someone else instead of taking a chance on them. That is probably all you need to know to hire a great concrete grinding contractor. Always heed this advice to find the best person for the job. Keep in mind the pros and cons of each method before you decide which one is the best to use. Choose wisely and make sure that you won’t make a choice that you will regret later.